Before 1924, members of the Winnipeg Skating Club (forerunner of today’s Winnipeg Winter Club) held their activities in the old Winnipeg arena and the Winnipeg Amphitheatre. In 1924, the Club purchased a 200-foot by 120-foot land parcel here, immediately south of the Royal Canadian Mounted Police Barracks at 75 Smith Street (since demolished) from the Hudson’s Bay Company (HBC). A building on the site, formerly the HBC Commissioner’s residence (occupants of which had included Joseph Wrigley and C. C. Chipman) and the clubhouse (?-1918) of the Cameron Highlanders, was demolished in June-July 1924. The Winnipeg Skating Club Company Limited was established at a meeting in the Marlborough Hall on 5 September 1924. Plans for a two-storey red brick and stucco structure were designed by Winnipeg architect G. W. Northwood, with an indoor temperature-controlled ice sheet measuring 171 by 75 feet on the main floor and administrative offices on the second floor. The funds for construction of the $30,000 facility were obtained in part by selling $100 stocks. The facility opened unofficially on 12 December 1924 with the official opening on Christmas Day, 25 December. In the spring of 1929, it was decided to expand the club and its facility. 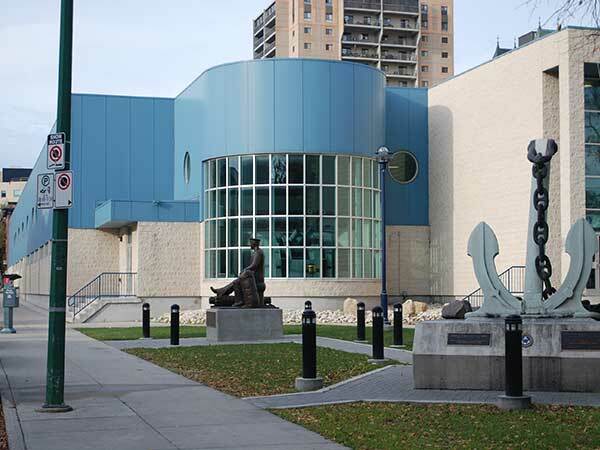 The Winnipeg Skating Club became the Winnipeg Winter Club and a further 200 feet of Smith Street frontage was acquired from the HBC. Plans were drawn up by local architect W. P. Over and the J. L. Guay Construction Company began work in late June on an enlarged building. Skating sheets were improved with the addition of a second surface measuring 33 by 136 feet, and five full badminton courts were added, along with two squash courts, a swimming pool, and an auditorium. Ceiling height over the courts was 20 feet high. Office space, lounges, and club rooms were incorporated into the designs. The finished building was heralded as the finest in Western Canada, and nationally rivaled only by the Granite Club of Toronto. The new pool room was 18 feet tall and the pool measured 25 by 60 feet, varying in depth from three feet in the shallows to the deep end of nine feet. Golf practice was had in the basement, in a 40 by 46 feet room. The entire project was completed at an approximate cost of $250,000, with the official opening on 12 December 1929, five years to the day of club’s first opening. By 1942, the club had expanded to ten badminton courts, four bowling alleys, spacious lounges, a dining room, and canteen. In 1942, the facility attracted the interest of the Royal Canadian Navy who were looking for a facility to consolidate operational centres around Winnipeg. In October 1942, an agreement was reached to sell the complex to the Royal Canadian Navy for $256,000, which would in turn be invested in Victory Bonds. The deal was approved by the Federal Treasury Board in mid-October, and conversion of the building began. Bowling alleys were converted to rifle ranges, the courts were renovated into living quarters, and the ice rinks were re-purposed into training areas. 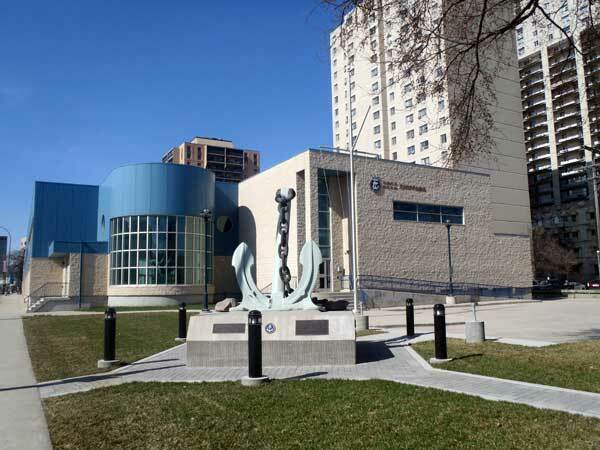 The building became home to the Royal Canadian Naval Reserve headquarters, replacing services and barracks previously based at a cramped site on Ellice Avenue and a recruiting office on Sherbrook Street. It contained areas for administration, training, mess facilities, housing quarters, and space for women’s naval auxiliary activities. The HMCS Chippawa, Canada’s second-largest training ship, was relocated to this site in early January 1943 and it was used for active training of naval personnel though mid-June 1945. The building was opened to the public on 20 November 1943, though renovations and layout so changed that long-time members of the club needed guides to navigate the redesigned premises. The building was demolished in 1998 to make way for a joint training facility and naval museum. In 1999, the new facility was built by the federal government at a cost of $7.35 million. It was officially opened by senior Manitoba Parliamentarian and Minister of Foreign Affairs Lloyd Axworthy at a ceremony on 28 November 1999. The 4,200-square-meter facility was built by Caspian Construction Limited and included classrooms, mess and drill halls, a parade square, and a computer training centre named for Waldron N. “Wally” Fox-Decent (Rear-Admiral and former Commanding Officer of the HMCS Chippawa). 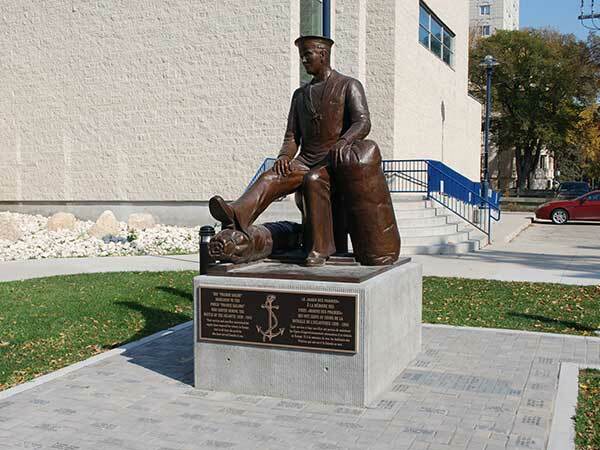 A monument beside the Naval Museum of Manitoba at HMSC Chippawa, unveiled on 11 November 2010, is dedicated to the men and women who served with the Canadian Navy between 1910 and 2010. It features the anchor from the HMCS Protecteur operational support ship. Also at the site is a monument dedicated to “Prairie Sailors” who served in the Battle of the Atlantic (1939-1945). “Highlanders move to new club house,” Winnipeg Tribune, 15 October 1918, page 5. “Skating Club to build new rink,” Winnipeg Tribune, 11 September 1924, page 1. “Four companies ask for incorporation,” Winnipeg Tribune, 11 September 1924, page 6. “Winnipeg Skating Club opens new clubhouse,” Winnipeg Tribune, 13 December 1924, page 8. “Society [Winnipeg Skating Club],” Winnipeg Tribune, 25 December 1924, page 7. “Skating Club will expand,” Winnipeg Tribune, 19 March 1929, page 14. “Handsome Winter Club for Winnipeg,” Manitoba Free Press, 22 June 1929, page 8. “Historic building to be demolished,” Manitoba Free Press, 22 June 1929, page 8. “New Winter Club finest in Western Canada,” Winnipeg Tribune, 11 December 1929, page 12. “Acme of comfort and luxury reached in great building,” Winnipeg Tribune, 11 December 1929, page 13. “Thoroughly equipped with facilities for sports,” Winnipeg Tribune, 11 December 1929, page 14. “Construction and equipment of club house credit to Winnipeg firms,” Manitoba Free Press, 12 December 1929, page 9. “Winter Club purchased by navy for training centre,” Winnipeg Tribune, 9 October 1942, page 13. “Navy men will “sleep in” in 1943,” Winnipeg Tribune, 22 December 1942, page 13. “News briefs,” Winnipeg Tribune, 2 January 1943, page 13. “Winter Club members will need guides,” Winnipeg Tribune, 18 November 1943, page 19. “Growth of Canadian Navy makes sea-power history,” Winnipeg Tribune, 18 November 1943, page 19. “One Tribe, two ships,” Winnipeg Tribune, 18 November 1943, page 19. “Hello soldier,” Winnipeg Tribune, 9 June 1945, page 17. “The Smith of Smith Street,” Winnipeg Free Press, 2 August 1986, page 6. “New naval training centre set,” Winnipeg Free Press, 22 July 1998, page A7. “Navy brass help launch rebuilt training centre,” Winnipeg Free Press, 29 November 1999, page A3.